When the boss, the wife or the kids are driving you crazy, take out your little stress ball and squeeze away. It will relax and calm your mind and make you feel altogether better. Give one to the boss, the wife and the kids too. You can all de-stress together. This fun gimmick will add a trendy appeal to your advertising promotion. It is a miniature football, made to look identical to a real one, but is also a stress ball, making it even more appealing as a fun give-away. Football is massive in Australia and hundreds of thousands of fans will be delighted to keep one of these on their desks at work, or in the home. They are cool and trendy and will set you apart from your competition. Our ball is manufactured from a flexible material that returns to its original shape after it is squashed. The design offers a classic oval football shape in a two-tone colour scheme. Bold bright panels in corporate colours contrast with plain panels that are ideal to brand with your company logo. Our listed price includes branding of your logo or graphic in a single colour print. We print your graphics onto stressballs using pad printing. 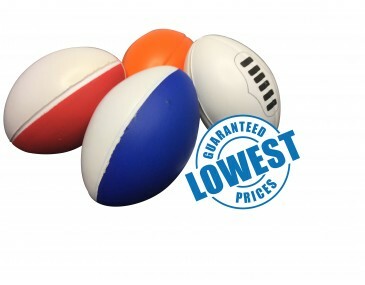 Stress balls make great give-aways and are ideal promotional gimmicks for any business operating in the sports industry, sports clubs, schools and colleges. Hand them out at your sport events, outdoor events and trade shows and get your image flying into the goal posts. Please note that our prices exclude GST and a print set up of $75 applies.